Are you planning your holiday in Rome and you don’t know which activity to experience ? 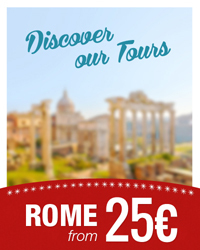 Try the best selection of tours and activities of the Eternal City to make your holiday unforgettable! Do you like cooking and would you like to discover the secrets of Italian cuisine? Give more value to your vacation in Rome with a cooking class held by an authentic Italian chef directly in her home’s kitchen. A different and joyful way to experience the eternal city! Have fun while learning the best Italian and Roman cuisine recipes and discover its cooking style with your new friend Cecilia, an excellent cook speaks your language (English, Spanish and Portuguese, as well as Italian of course) and puts you at your ease with her enthusiasm and cheerful attitude. She will reveal all the secrets of the traditional Italian cuisine, passed down from generations of women guardians of good and health food. You will learn how to cook the best Italian dishes and at the end of the class you taste your dinner accompanied by an excellent Italian wine. If your dream is to get lost in the flavors of Italian and Roman tradition, do not miss Cecilia’s tips and tricks! The cooking class dinner party takes place with a minimum of 2 and a maximum of 4 people.